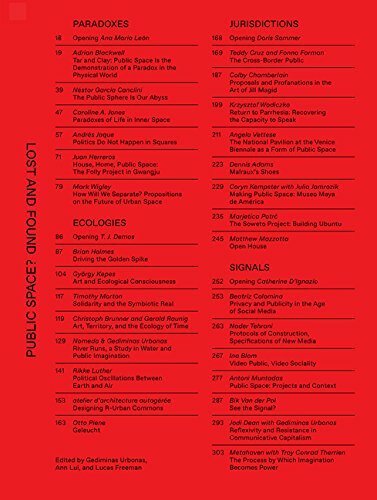 “Public space” is a potent and contentious topic among artists, architects, and cultural producers. Public Space? Lost and Found considers the role of aesthetic practices within the construction, identification, and critique of shared territories, and how artists or architects — the “antennae of the race” — can heighten our awareness of rapidly changing formulations of public space in the age of digital media, vast ecological crises, and civic uprisings. Text: Urbonas Gedminas, Freeman Lucas et al. pp. 300; hardcover. Publisher: SA+P Press, 2017.